This April, The Roxy brings you four of Stanley Kubrick's greatest films--all of them projected on gorgeous 35mm film. Stanley Kubrick’s painfully funny take on Cold War anxiety is one of the fiercest satires of human folly ever to come out of Hollywood. The matchless shape-shifter Peter Sellers plays three wildly different roles: Royal Air Force Captain Lionel Mandrake, timidly trying to stop a nuclear attack on the USSR ordered by an unbalanced general (Sterling Hayden); the ineffectual and perpetually dumbfounded U.S. President Merkin Muffley, who must deliver the very bad news to the Soviet premier; and the titular Strangelove himself, a wheelchair-bound presidential adviser with a Nazi past. 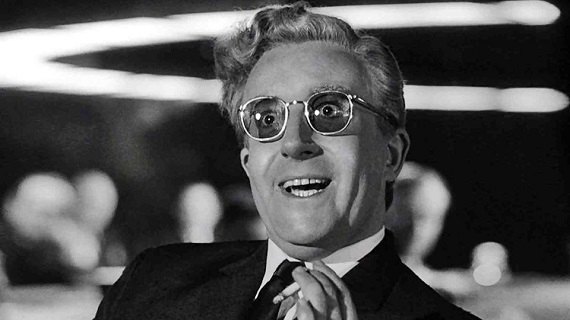 Finding improbable hilarity in nearly every unimaginable scenario, Dr. Strangelove, or: How I Learned to Stop Worrying and Love the Bomb is a subversive masterpiece that officially announced Kubrick as an unparalleled stylist and pitch-black ironist.